Advertisers and marketing professionals worldwide are including Ultraflex Systems perforated window film in their digital branding and promotional strategies. Ultraflex Systems is the innovative leader in the digital media industry with over 60 wide format PVC and specialty substrate printable billboard, banner, flooring, window and wallcovering materials. 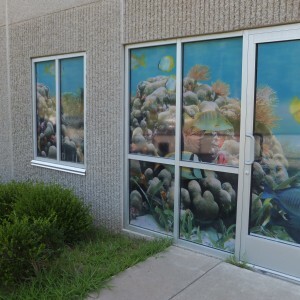 Other media in this Ultraflex Systems line includes underwater, flooring and wallcovering materials. FloorFlex Digital printable floor vinyl and UltraCarpet Extra tufted-white pile carpet media are ideal products for use in foyers, lobbies, waiting rooms and tradeshow booths. AquaFlex is our printable Latex substrate and is engineered to lay flat in underwater applications such as pools and ponds. Wallscapes Wallcovering is one of our flexible wallcovering materials that’s often used in the USA, England, Scotland, Mexico, Canada and other countries worldwide for high-end wallcovering and banner applications. Many other exceptional imaging products are available in Ultraflex Systems Front-Lit Media, Mesh Banner Material, Signetics Magnetic Receptive Media, VorTex Textiles and other product lines. Contact a digital media specialist at Ultraflex Systems today to learn more about creating outstanding campaigns with our perforated window film and other superior quality digital media.